● Over 6000 custom designed patterns for all vehicles. ● Fit for passenger areas, cargos, trunks and virtually all floor surfaces. ● Many one-piece, wall-to-wall and over-the-hump patterns. ● Fit to same patterns as Lloyd Ultimat Carpet mats. ● Extremely complete protective coverage. ● Exact Coverage for areas not available from other tray and liner products. ● Great protection for minivan large areas. ● Thick 80 mil clear vinyl. ● Non skid nib backing. ● Clear protection reveals floor color. ● Flexible for better fit. ● Won't Wrinkle or crack even after years of use. ● Aggressive nibs keep mats in place. ● Let’s the beauty of the original floor show through. ● Easy to maintain good looks. ● Factory compatible anchoring devices are included with each set for vehicles with a factory installed hook, snap, post, etc. ● Mats for vehicles without OE anchoring devices, are equipped with Lloyd’s proprietary anchoring system. ● Five year materials and workmanship warranty. 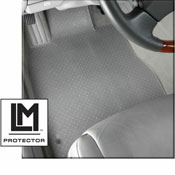 Protector Mats should not be placed over other floor mats. Protector Mats are designed as a stand alone mat item. Protector Mats are equipped with anchoring devices to keep them securely in place. These devices may not work properly if Protector Mats are used over another accessory floor mat.